Your brain is making you fat! Excerpted from "A Big Fat Crisis"
The limits of self-control are key factors in our poor eating habits. One reason self-control is limited is because the capacity of the brain’s information-processing system is relatively minuscule. Scientists generally agree that our brain has two operating systems: a cognitive system and a noncognitive system. The cognitive system requires conscious awareness; it is reflective and deliberate. It can perform mathematical computations, make novel decisions, and engage in long-term planning and “out-of-the-box” thinking. It operates, on average, less than 5 percent of the time and is the internal resource responsible for self-control. The other 95 percent of the time, our noncognitive system is in control. Impulsive and immediate—and following well-established rules and patterns—it is responsible for quick, automatic decision-making. The noncognitive system is often emotionally charged and responds to external signals, cues, information, signs, or symbols. When a person is under stress, tired, preoccupied, or overwhelmed with too much information, noncognitive processing dominates over thoughtful decision-making. Put more simply, when we are overloaded, we tend to make decisions impulsively. And when it comes to food, impulsivity typically leads to nutritionally poor choices and what we perceive as a loss of self-control. We can think of our brain as being engaged in a constant ebb and flow between deliberate and automatic processing. Sometimes it is more of a fight between two mismatched warriors, like David and Goliath. David represents the small, nimble, and smart cognitive force that has to face a massive, primitive, noncognitive giant that is in charge most of the time. Goliath is unflagging and never sleeps. Sometimes David can win, but it is nearly impossible for him to win all the time. David can be distracted, he can be worn down, and he needs to sleep. This is not a single battle but an eternal struggle. Among participants who had to memorize the two-digit number, 41 percent chose the chocolate cake, while among those who memorized the seven-digit number, 63 percent chose chocolate cake, a 50 percent difference. Those who had to memorize the seven-digit number said their decision was influenced more by their emotional, impulsive side than by their rational, prudent side. The researchers concluded that the group memorizing the longer number had less available brainpower to carefully consider the items, and resorted to impulse. Given how taxed the average person is by the stresses of his or her job and family life—stresses that far exceed having to memorize a seven-digit number—our tendency to take mental shortcuts when it comes to figuring out what to eat is understandable. Is it any wonder that we sometimes choose cake over fruit? Before we do, does it cross our minds that one bite of cake might have five times the calories of a bite of fruit? Probably not. The part of the brain that governs conscious awareness is relatively small and processes only forty to sixty bits per second, the equivalent of a short sentence. The brain’s entire processing capacity, however, which includes the visual system as well as the unconscious, automatic system, is estimated to process eleven million bits per second. This is faster than a sophisticated computer and about five hundred thousand times the power of our conscious awareness. To better appreciate how small our David is compared to our Goliath, look at the grid in [the] Figure [below]. 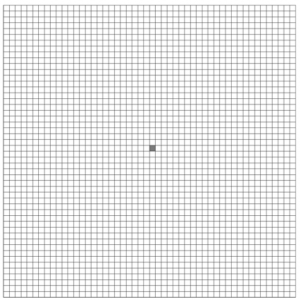 If this 50 × 50 grid represents the entire cognitive capacity of all the neurons of the human brain (Goliath), the single dark square represents an amount about two hundred times larger than the cognitive capacity of our conscious awareness (David). Why is Goliath so large compared to David? Goliath has to direct all the minutiae of every gesture, movement, action, and reaction. Goliath gets us out of bed, moves our arms and legs just the right amount so we don’t fall over, and alternates our fingers back and forth to efficiently scratch that itch on our scalp. Goliath makes sure that when we walk from the house to the car, we lift our feet just so high to ascend the correct distance from the ground. When we get in the car, Goliath ensures that we elegantly maneuver to a sitting position without bumping our head, and that we find the brake and gas pedal. Goliath is simultaneously processing all that our senses experience—the sights of the road ahead, the sounds of the freeway, the smells of the new air freshener, the aftertaste of coffee, the wind against our cheeks. As Goliath is navigating the journey, David, however, is focused on a very narrow set of goals: what to get Mom for Mother’s Day, which movie to see this weekend, whether Goliath automatically locked the front door, and whether David should go back home and check. Because our cognitive capacity is so limited, most of us can do or think about only one thing at a time. If we multitask, we can consciously direct only one of the tasks, while the other is handled automatically. In an experiment conducted by French researchers France Bellisle and Anne-Marie Dalix, a group of forty-one healthy, normal-weight women were asked to come to the laboratory weekly for four weeks. The first week they were asked to eat a meal alone. The following week they had to eat while listening to a description of the food’s tastes and textures. The third week they were asked to eat while listening to a detective story. And the fourth week they were asked to eat the meal with three other women. The meal was exactly the same each visit. The women ate the same amount at every meal except when they had to listen to the detective story. On that occasion, they ate an average of seventy-two calories more—even though they rated their levels of hunger exactly the same on all four occasions. Listening to the detective story was the only situation in which the women’s attention was directed away from their food. In the first instance, there was nothing else but the food to attend to; in the second, they were directed to focus on the sensual qualities of the food. When dining in company, they would have watched the other women and might have felt like they were being watched, possibly making them more self-conscious of what they were eating. The lesson: when we don’t pay close attention to the food on our plates, it is easy to eat too much. Although distractions can lead to overeating, the limits of our memory also contribute to eating too much. When amnesiacs with no short-term memories were offered meals in quick succession, even just one minute apart, they kept on eating and consumed full plates each time. Afterward, they reported no change in their feelings of hunger because they didn’t remember that they had already eaten. In studies to test how important memory is for people without amnesia, British researcher Suzanne Higgs found that when subjects were prompted to remember their last meal, they ate less. She discovered this by having participants come to her lab for lunch at 12:30 p.m. and then again at 3 p.m. for a biscuit taste test. For lunch, participants were given pizza and asked to rate it as well as their own feelings of hunger and fullness. In the afternoon, they were again asked to rate their hunger, fullness, and desire to eat. Half the group was then asked to think about the pizza they had for lunch and write down their thoughts about it, while the other half was simply asked to write down whatever thoughts they wanted. Afterward, both groups were presented with three plates full of different types of biscuits and asked to taste and rate them. After eating, the researchers measured how full the participants felt and how much they ate. The group that did not write about the lunch ate more of the biscuits but rated their fullness, hunger, and desire to eat the same as the other group. Yet the other group consumed 21 percent less of the biscuits. Dieting also requires a good memory because it demands that people keep track of how much they eat. But most people don’t do this very well, and there are multiple reasons why. Even if we have a good memory, if we eat while multitasking, it’s possible we won’t remember that we ate at all. Another common barrier to keeping track of our food is that we may not know what’s in the food or how much we are eating, especially if we aren’t the ones preparing and serving it. And if people can’t tell how much they are eating, it’s no surprise that researchers also have considerable difficulty in measuring what and how much people eat. Until now, there has been no objective way to measure what people eat other than to keep them locked up in a laboratory, measuring all the food they are served and subtracting what they leave on their plates. Outside the laboratory, when people have unlimited choices, they eat different foods in varying amounts at different times. Therefore, what a person reports eating over the course of a single day may not reflect what he or she eats over a week, a month, or a year. Not only do researchers measuring diet have to overcome the challenge of variability; they also have to overcome inherent limitations in memory and attention. How accurately can people remember what and how much they ate over time? To help figure out the best way to measure what and how much people eat, scientists have to be able to verify whether people are really eating what they say they are. One method to verify people’s food consumption is to draw their blood and collect samples of their urine to test the concentration of various nutrients. If people really ate what they say they did, we should be able to see some of the food by-products or nutrients that were absorbed. These nutrients are called biomarkers. In one of these investigations, the Observing Protein and Energy Nutrition (OPEN) Study, funded by the National Cancer Institute, researchers assessed how well people could remember and report what they usually eat. Almost five hundred participants were asked to fill out a food frequency questionnaire detailing exactly how often they ate a serving of each of the foods listed. Based on their responses, researchers calculated the average daily calories consumed. Beyond this questionnaire, study participants were also asked to recall what they had eaten in the previous twenty-four hours. Their reported consumption on both the food frequency questionnaire and the twenty-four-hour recall was checked against blood and urine biomarkers, which indicated the amount of protein and calories actually consumed. Compared to what the biomarkers showed, the food frequency questionnaire suggested that both men and women underreported what they ate by more than 30 percent. This enormous calorie gap is, in part, due to the inability of the food frequency questionnaire to accurately reflect what is eaten. Nevertheless, even when reporting the foods they ate in the last twenty-four hours, which depends on short-term memory, participants still underestimated the quantity of food eaten by up to 20 percent. Given that, on average, women consumed 2,277 calories per day, their underestimates ranged from 358 calories at best to 872 calories at worst. The range of men’s underestimates was even wider: from 337 calories on the twenty-four-hour recall to 1,031 on the food frequency questionnaire. These “missing” calories could easily represent an entire meal. In general, overweight individuals tended to underreport more than those of normal weight. This is probably part of the reason they are more likely to be overweight in the first place: if they cannot recognize that they are consuming too much, they cannot easily limit their intake. Excerpted from: "A Big Fat Crisis: The Hidden Forces Behind the Obesity Epidemic—and How We Can End It" by Deborah A. Cohen. Excerpted by arrangement with Nation Books. Copyright 2013.